EcoVantage Catalog: E-Z Out™ Jr. 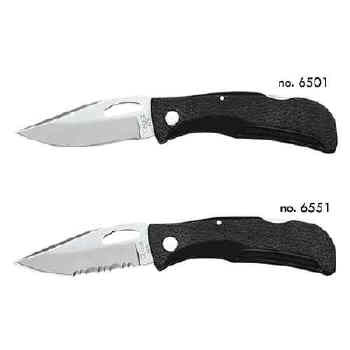 The E-Z Out™ series are one of America's most popular knives. The combination of size, shape and easy one hand opening make it a favorite amongst sportsman, tradesman and outdoor enthusiasts. The handle on the E-Z Out is made of reinforced fiberglass making it unbreakable under normal usage. The over molded SoftGrip™ inserts create a comfortable sure grip. The E-Z Out Jr is a smaller version of the full sized Skeleton.